MONTREAL, QC – Brewpub chain Les 3 Brasseurs/The 3 Brewers has announced details of its latest monthly rotating feature beer, which shares the name but not the style of last year’s holiday offering. Known as La Ale des Fêtes in Quebec and The Festive Ale in Ontario – names that were used for a British Strong Ale in 2016 – the new beer is a 6.9% abv and 45 IBU ale brewed in the style of a Belgian Dubbel. La Ale des Fêtes/The Festive Ale will be on tap for a limited time at all Les 3 Brasseurs/The 3 Brewers locations in Quebec and Ontario. 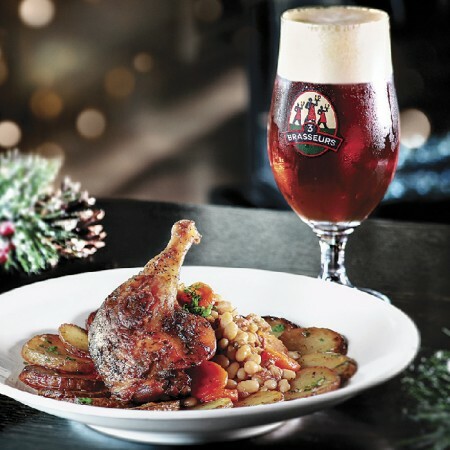 It is also featured in a holiday special which pairs a pint of the beer with a meal of duck leg confit and Sarlat potatoes for $23, from November 28th to January 3rd.